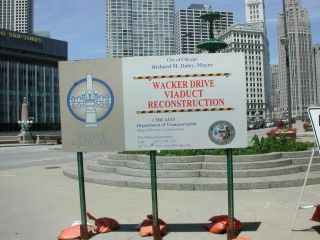 There was still some construction activity on Wacker Drive even as late as 2005. The new Vietnam War Memorial was built at that time in the section of Wacker just East of State Street. It is in the same area labeled UBS (UNITRIN Bldg Section) during the main construction period. There is a separate section on this page for the construction of the Vietnam War Memorial. The May 15, 2004, pictures of Dearborn to Clark Overview, State to Dearborn Overview, Wabash to State Overview, Michigan to Wabash Overview, UNITRIN Bldg Section, Jeweler's Bldg Section, Exec Plaza Section, and Michigan Av Section, will be the final ones posted to this section of the web site. 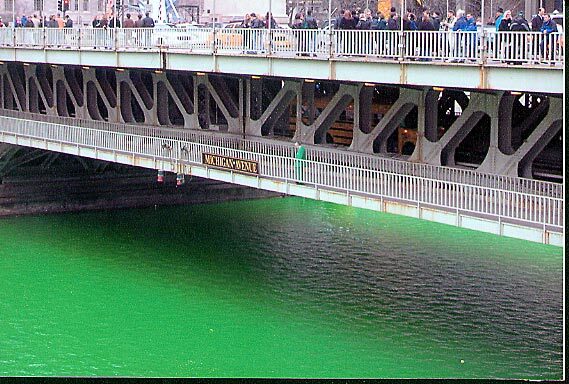 This is due to the completion of the current Revive Wacker Drive construction contract. For the six week period from February 1, 2003 - March 8, 2003, there were no pictures posted to this site. This hiatus was caused by personal injury, due to being hit by a taxicab on January 29, 2003 (specifically, a Ford Crown Victoria). The accident occurred on Clark St. right by Quaker Tower. After looking at the Wacker Drive construction pictures, go to Wacker Fashions (the first folder), just for fun!!!! My suit fashions will help the Wacker construction project come to a "fitting" conclusion. Wacker Drive is a major two-level highway which runs through the heart of downtown Chicago. Part of it runs East - West along the main branch of the Chicago River. The other part runs North - South along (but about a half block away from) the South Branch of the Chicago River. Starting Feb 23, 2001, and lasting for about 20 months, will be a big reconstruction project. It involves the portion of Wacker Drive running from Michigan Av (on the East) to Randolph St (on the South/West). The entire roadway/structure (both upper and lower) will be torn up and/or asunder, and then it will be completely rebuilt. This will include the sidewalks, as well as the street. Work will be done literally up to the walls of the buildings along Wacker. This project has been compared to rebuilding the Stevenson, Kennedy, or Dan Ryan expressways right in the middle of downtown. I will be taking daily pictures of the construction work in some sections of Wacker Drive from my Marina Towers balcony. These sections will be highlighted in the maps, below. I will post one picture a week (probably the Saturday picture) from each section on this web site to provide a photo update of the progress of the construction. The pictures you see here will show a unique perspective of the construction project. There will, of course, be news helicopters (both radio and TV) circling above Wacker Drive throughout the time of the project. But, no "egg beater" can reproduce the perspective that my balcony provides. The parts of Wacker Drive shown in this map are mostly finished, except for the Clark and Wacker Intersection (which is current under construction). Still, some work needs to be done on the mid-block sections. The sidewalk on the North side of Wacker (the river side) still needs to be built. Also, new concrete hand rails will be installed. They will be designed to match the look of the old hand rails. CW - Clark and Wacker Intersection: Construction started in Jan, 2002. DW - Dearborn and Wacker Intersection: Construction started in Aug, 2001. SW - State and Wacker Intersection: Construction started in Feb, 2001. Dearborn to Clark Overview. Includes RD - R.R. Donnelly Section, and 55 - 55 W Wacker Section: Construction started in March, 2001. State to Dearborn Section. Includes LB - Leo Burnett Section, and RH - Renaissance Hotel Section: Construction Started in Feb, 2001. This map shows the parts of Wacker that will be worked on this year (2002). The most interesting part to watch is the section between State and Wabash. That section will be totally reconfigured. All the other parts of the project involved tearing out the old structure, and replacing it with the new structure. But, at the end, it still looks similar. But, the section between State and Wabash will look completely different. There will be a much larger plaza area on the lower (river) level that there was before. WW - Wabash and Wacker Intersection: Construction started in April, 2002. WB - Wabash Bridge Section: Construction started in April, 2002. Wabash to State Overview. Includes UB - UNITRIN Building Section and JB - Jeweler's Building Section. Construction started in Oct, 2001. It also includes the Vietnam War Memorial (in the same location as UB on the map above). Construction started in April, 2005. 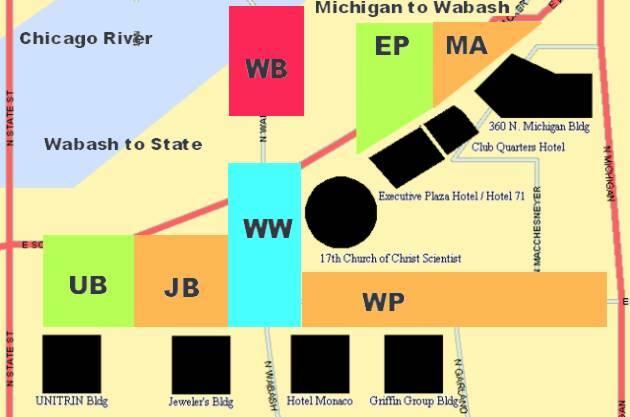 Michigan to Wabash Overview: Includes EP - Executive Plaza Section (construction started in Oct, 2001), WP - Wacker Place Section (construction started in Jan, 2002), and MA - Michigan Av. Section (construction started in July, 2002).